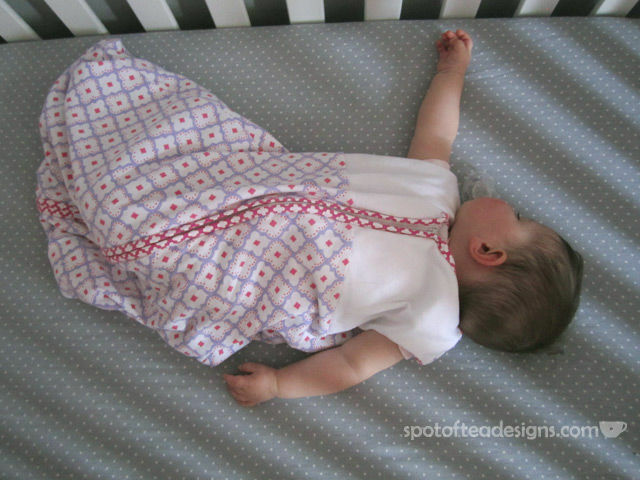 Spot of Tea Designs readers have already heard me talk about my love of HALO Sleepsacks several times now, including recommending it as one of my top 10 products for children newborn age to four months. 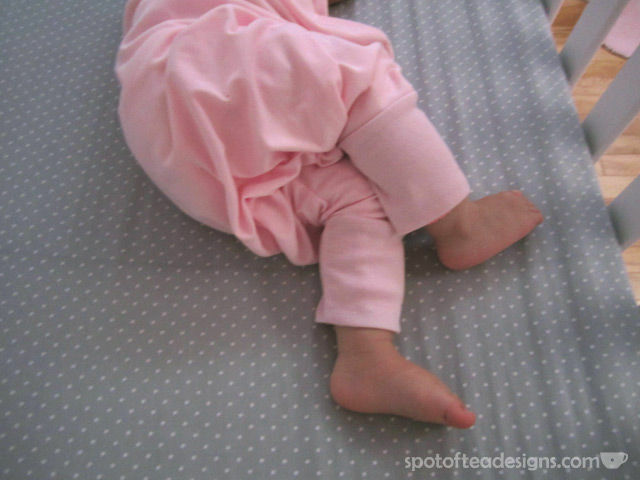 Brielle wore her Sleepsack Swaddle for a while, before transitioning to regular Sleepsacks (including the adorable Pottery Barn kids print seen above!) 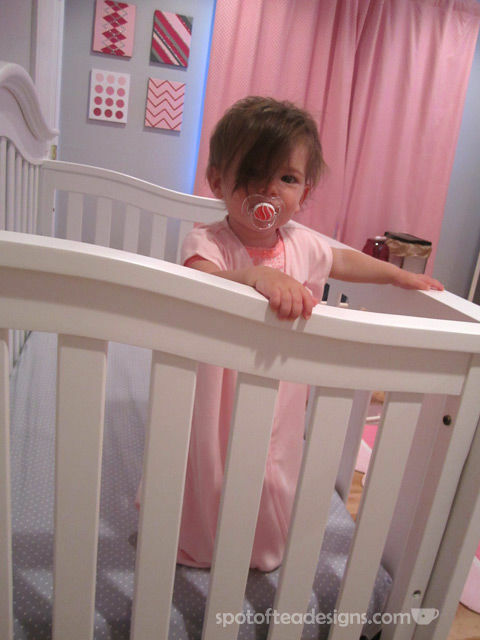 Once I had an early walker on my hands at nine months, I found she often would walk around in her crib in her sleepsack during night wakings and it sometimes led to bumps and bruises on her face!
! Upon reviewing the recommended sizes based on weight and height we went for a size large. About a week after her first birthday, we tried it out! Let me tell you, when you first unwrap it from the packaging, this thing looks LONG! They say they are made to allow you to have their feet tucked up inside like a regular sleepsack or with their feet out. I know she’s just barely into the large size so maybe we need to wait until she’s a little bit bigger to use it on a regular basis for overnight sleeping. But for naptimes, where she barely moves for 45 minutes, and I have a video monitor on her, I’m confident she can safely enjoy her lightweight knit sleepsack. Isn’t this just the sweetest time? Look at those toes! Of course when it come to winter time, I’ll be opting for the micro fleece style probably with socks on since her room is cold. But I love these sleepsacks as an alternative to dangerous blankets. We’ll continue to use them as long as they make sizes to fit her! When she woke up I was greeted at the door by a happy girl who (while you can’t necessarily tell from this photo) was standing tall with her feet outside of her sleepsack, just as designed. Love that bedhead! 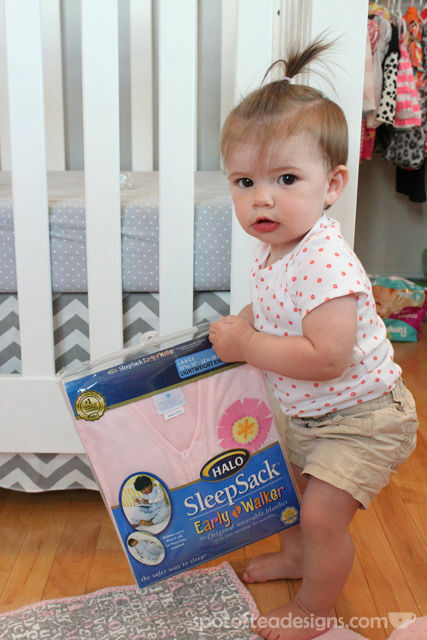 As a reminder, HALO Innovations is dedicated to putting the health, safety and well-being of babies first. 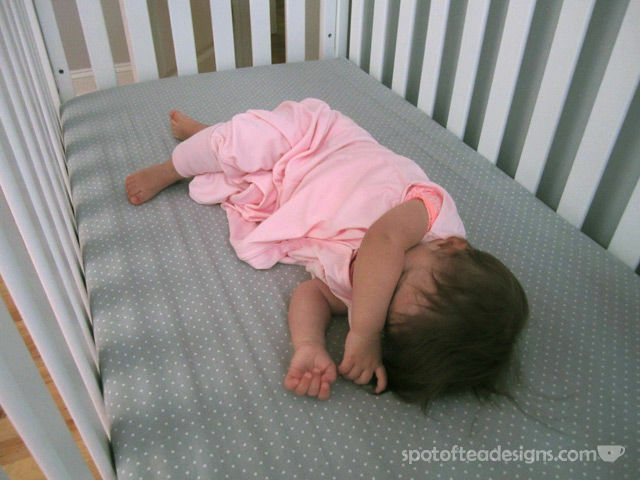 From our new bassinet, the HALO™ Bassinest™ Swivel Sleeper to our HALO® SleepSack® wearable blankets, which are now used in over 1200 hospitals nationwide, HALO is committed to helping babies sleep safely. To learn more about Halo, check them out here: Website | Facebook | Pinterest | Twitter | Google+. I’m very happy to report the team at HALO has generously offered one Spot of Tea Designs reader a HALO SleepSack Early Walker of their very own! Enter via the Rafflecopter widget below by September 19th for your chance to win. Mobile issues, if you’re having trouble connecting to the giveaway, enter via this link.